The stunning Husqvarna Viking Designer Topaz sewing and embroidery machines offer a wonderful airy design that unleashes your creativity, allowing you to create greater projects and embroideries than ever before. The ability to uncover a whole new world of embroidery designs will unleash your imagination. Fabulous space and creative freedom, in combination with built-in assistance features that are exclusive to the Husqvarna Viking brand, make these precious gems truly irresistible! The generous sewing space gives you more room for large projects. The extra large embroidery area allows you to stitch spectacular designs with just one hooping. Hundreds of breathtaking stitches inspires endless creativity. The unique exclusive Sensor System technology senses your fabric thickness for perfect, even feeding. The exclusive Sewing Advisor feature optimises your sewing. The USB embroidery stick conveniently transfers designs between your computer and your Designer Topaz 25 sewing and embroidery machine. High quality stitches for every technique. Choose from 160 stitches and 3 alphabets on the Designer Topaz 25 machine. Choose the stitch or stitch number on the easy touch panel and you are ready to sew! Your stitch appears in actual size at recommended settings on the Designer Topaz graphic display. Ideal for big ideas! 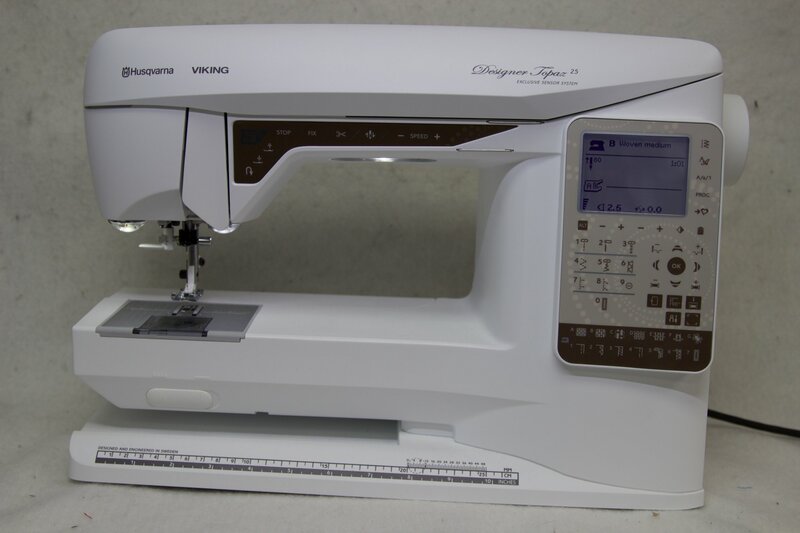 Both Husqvarna Viking Designer Topaz sewing and embroidery machines feature extra long free arms and sensational embroidery areas. The embroidery area measures up to 240x150mm and gives a wide range of options on embroideries. Adjusts to your fabric thickness for perfect, even feed. With a tap on the foot control or the touch of a button; the Sensor Foot Pressure on your Designer Topaz sewing machine automatically senses the fabric thickness - resulting in a perfect even-feed of any fabric. The sensor foot pivot senses the fabric thickness for instant pivoting. Free Husqvarna Viking software to download. View designs as thumbnail images, read different embroidery file formats, add trim commands, print catalogues and more! Easy and effortless. No guesswork! Enter fabric type, weight, and sewing technique and the exclusive Sewing Advisor feature will prepare all the settings - stitch, stitch width, stitch length, thread tension, sewing speed and presser foot pressure. It will also recommend the presser foot, needle type and size. You will never sew alone again!